We are dedicated to enhancing the educational experience of our higher degree research students so they are better prepared for professional careers as hearing science researchers, engineers or hearing health clinicians. Students undertaking research projects in association with the HEARing CRC are likely to benefit from their close collaboration with our industry and clinic-based Members. Previous students have found that working in the unique HEARing CRC environment has helped them to developed commercial and project management skills alongside advanced research and technical skills. 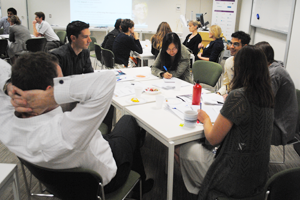 enhancing the postgraduate learning experience by encouraging project supervision from non-academic HEARing CRC Members, and interactions with other students and industry representatives as part of the HEARing CRC’s Annual Student Symposium. A new element of our Postgraduate Program is focused on mentoring. We are keen to link students who wish to find a professional mentor with an appropriate person in the HEARing CRC or the broader community. Please contact us if you would like to act as a mentor to one of our students.